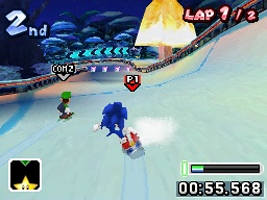 While the game's title and many of the events are the same, this portable version of Mario & Sonic at the Olympic Winter Games has been developed especially for the Nintendo DS. Use the touch screen to play each of the games on offer. You can compete with other players through local wireless multiplayer as well.